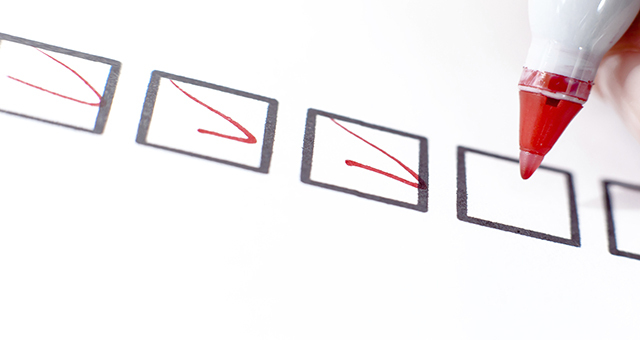 Academic leaders may already rely on many checklists without calling them that. They probably go through a list of requirements before posting advertisements for faculty positions to make sure they’ve included all the essential details. Their institutions probably have a set of items they want assembled in each employment package for a new hire. They probably make sure that all the documentation is in place before sending a tenure or promotion application to the next level for approval. The question is: Why don’t they make greater use of this device for other complicated responsibilities? For example, searches often frustrate both candidates and hiring committees by wasting time and missing opportunities. Candidates sometimes feel as though they’re asked the same questions over and over again by different interviewers who weren’t present at other sessions. Hiring committees sometimes find it difficult to make a decision after the interviews have been conducted because they received one type of information from this candidate but neglected to ask for it from that candidate. These problems can be reduced or eliminated through a checklist system. The checklists would indicate which offices were responsible for collecting which documents, who would ask what questions throughout the interview process, and at what point the list would be examined to make sure that all the essential tasks had been completed. In a similar way, although colleges and universities frequently have checklists in place for when new members of the faculty or staff are hired, they’re less likely to have such systems in place for when people are terminated. In most circumstances, that oversight isn’t much of an issue. People who are retiring or who plan to leave the institution at the end of the current contract frequently provide sufficient advance notice for administrators to check that all university equipment has been returned, ID cards canceled, keys surrendered, signatures obtained, benefits transitions explained, and so on. But when someone is terminated for cause and the separation must occur very quickly or when someone breaks a contract and leaves without adequate notice, greater confusion often erupts. The office of human resources deals with these issues so often that they may know what needs to be done on their end, but what steps have to be taken at the departmental or college level? How can information and equipment be secured so that problems don’t arise later? Checklists can prevent problems that may not otherwise be visible for months or even years after an employee departs. The checklist approach lends itself to many aspects of an academic leader’s work. Moreover, it’s not necessary for a checklist to be on paper for it to be effective. Microsoft’s OneNote app contains a To Do List function that is easily adapted to serve as an administrative checklist. Checklist templates for programs like Microsoft Excel and Word are available through template.office.com, and numerous apps exist that allow academic leaders to create checklists on their smartphones and tablets. We devote a great deal of time in academic leadership training to complex processes like strategic planning, the expected utility and analytic hierarchy methods of decision making, and calculating metrics for processes that often seem to resist quantification. The irony is that simple administrative devices like checklists, which can have an immediate and significant impact on our effectiveness as academic leaders, go all but ignored. But using checklists as an administrative tool can help academic leaders avoid mistakes, stay on top of complicated tasks, and free up their time for the more visionary aspects of their jobs. Gawande, A. (2010). The checklist manifesto: How to get things right. New York, NY: Metropolitan Books. Lagatree, K. M. (1999). Checklists for life: 104 lists to help you get organized, save time, and unclutter your life. New York, NY: Random House.